It is time to introduce another quality article into the mix. As our dedication to providing the best quality products and information on active gear and outdoor sportswear, we are eager to share the best camping tables with you! Now, have you ever been camping and realized you need a quality table that can withstand the outdoor elements? Has the idea of taking your dining table occurred? It’s okay, it has for us too! Until, we discovered that there is a wide variety of different brands and manufacturer that share one common niche, providing quality outdoor gear such as camping tables. With that said, we went on a hunt to research the best quality camping tables that an individual can buy today. We also focused on providing variety, affordable pricing, and quality. Without further wait, let’s discuss the top ten best camping tables and the brands that offer the best. Our intention is to provide simple solutions at a great quality price. Here is the first one of the motley bunch! If you are looking for a high-quality camping table to accommodate your upcoming camping adventures, we have the product for you. When it comes to the camping industry, there are not many companies that can compete with Coleman. The Coleman Outdoor Compact Table is known as one of the best products on the market today, thanks to the high-quality design and numerous features. So, before you gather up the family and friends, here is a product worth your consideration. When it comes to camping, we know that the last thing you want to do is spend time assembling gear. Thanks to the manufacturer, this camping table was designed to assemble in minutes. All you need to do is snap together the legs and unfold! The best part is that the company used a special, lightweight aluminum material that makes carrying this table incredible easy and hassle-less. As we evaluated different products for your consideration today, one aspect that we always kept an eye out for was warranties and guarantees. The reason being, this is a manufacturer's best way of assuring new consumers that their product is high-quality. What we thought was great about this product was that consumers will receive a standard 1-year warranty with their purchase. So, should anything go wrong, this brand has you covered? As far as cost is considered, this product is considered one of the most cost-friendly options that we have for you today. In fact, you might not find a better price in the industry, online or in-stores, than this one – especially when you begin to consider the value that this table offers. With an easy-to-setup assembly, high-quality and durable design, and spacious 4-person seating – it’s clear why this product represents the pinnacle of the market. Consumers will appreciate that this product can be assembled in minutes, without struggle or hassle. The manufacture built this product to be lightweight so that campers can travel with it. This is a great table that can comfortable seat up to 4 individuals, making it a great accessory for small families or friends. This product is designed to handle years of use and can handle whatever environment or weather situation Mother nature has in store. The company that made this product is considered the leader of the camping gear industry. Some consumers have complained that this table is quite flimsy and cannot withstand the 100-pound weight capacity. Frequent campers have expressed that the end pieces tend to fall off easily. 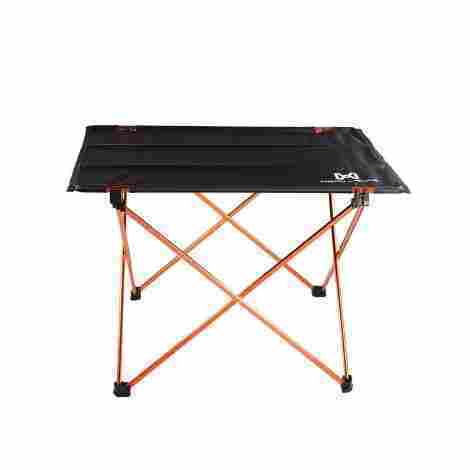 The Best Choice Products Folding Table is quickly becoming one of the most popular portable tables on the market today among campers. Reason being, this product comes in a wide variety of sizes and is considered one of the most durable tables for extensive use. So, if you are looking for an easy-to-setup table with numerous, impressive features, this product may just be for you! So, the first thing that caught our attention during the evaluation process was that this product came in not just one size, but three different sizes, ranging from 4-feet, 6-feet, and all the way to 8-feet. In other words, whether you are planning on having a large family camping party – or even a smaller get-together, this product can rise to any occasion. All you need to do is fold it up, store it in the car, and unfold it at the campsite. It’s not a farfetched statement to say that the outdoors can be quite dirty, especially when you consider that it may rain, causing dirt and mud to splash up on your camping gear. With that being said, it’s important to purchase gear that is easy to clean, after your vacation is over. The best part about this specific camping product is that individuals can clean up any mess or stain off this table with both soap and water and either a sponge or brush, depending on the need. When it comes to purchasing any product, it’s important to take into consideration the cost of an item. Now, this camping item is priced slightly higher than the number one table on our list today; however, this should not be discouraging to any consumers. It’s incredibly important that, as responsible consumers, to really look at the value that you are receiving. This product comes in numerous different sizes and made from some of the strongest materials out there. So, not only does this product offer variety, it offers the durability and assurance that it can withstand many camping adventures. Consumers have the option to choose from three different sizes, giving them the option that many other competitors do not offer. This specific camping product is very easy to clean and maintain. 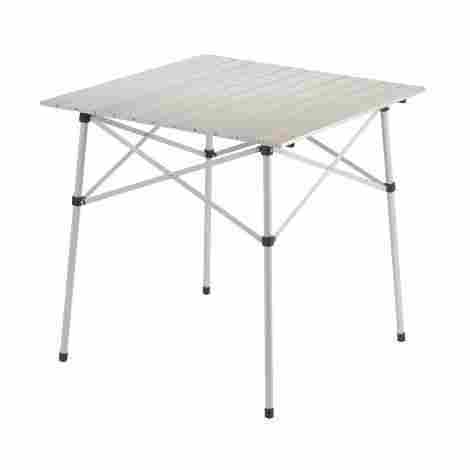 Campers can adapt this table for numerous different uses, including camping, parties, or even wilderness picnics. Thanks to unique innovations in the design of the product, users will find comfort in the stable and secure legs to hold-up their food and other personal items. Some consumers have complained that this table is too heavy for frequent camping trips. Campers have mentioned that these tables, while durable, do not hold well when individuals lean on them. When it comes to unique designs and great usability, there are no better products than the Camco Deluxe Folding Grill Table or Kitchen Table. This product was designed with style, flair, and strength so that, no matter what camping adventure you have in mind, you won’t want to forget about this product. Did we forget to mention that it’s so easy-to-set up that you can do it seconds? Let’s explore some more! So, what makes this product such a valuable option to consumers and campers is that it’s incredibly easy to assemble. In fact, many consumers have said that, in comparison to other camping tables that you can find in-store or online, this one is the easiest! Partner this two different design options, grill tables and kitchen tables, and you have one product you can’t pass up! Now, while a product may be visually appealing, it’s more important that it’s built well and from high-quality materials. Fortunately for consumers, this product offers this and more. Made from some of the strongest materials on the market, campers will appreciate the durable steel frame and the lightweight aluminum design. So, whether it rains or snows, this product can withstand but the test of time and Mother Nature. When it came to evaluating this product, the first thing that jumped out at us was the price tag. So, we anticipate that consumers may be taken aback by this. In accordance with our buying guide, this specific product is considered one of the most expensive; however, it’s equally important to consider the value that this manufacturer is offering. In this, we can say that there are no products that are designed as well as this – or offer the versatility or storage as both the grilling table and kitchen table. Consumers have the option to choose between two different styles of tables, a grill and kitchen table. Campers can set-up and assemble this product in seconds, without struggle or confusion. Thanks to the materials used in the design, this table is durable and can withstand extensive use. All standard purchases of this product come with a carrying case. Campers have complained that their product suffered and showed signs of rain and wear and tear. The top part of the table is very slippery, which can prove to be challenging when cooking or eating. 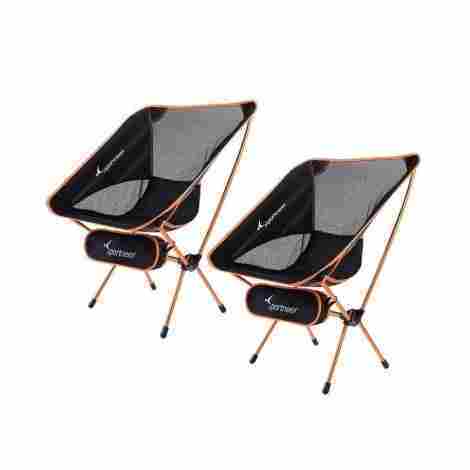 If there is any product on the list today that we are excited to share with our readers today, it’s Sportneer Portable Lightweight Folding Hiking Chair and Table. This product has risen to the top of the market thanks to its stability-focused design, rust-free materials, and lightweight features. So, before you are quick to grab just some old, plastic table, check out what this brand has to offer. If there is one part of this camping product that stood out to us, it was the fact that the manufacturer chose to use rust-free materials. So, if you are outside and all the sudden a rainstorm happens, this product can stand firmly on the ground and handle both the wind and the rain. This can be attributed to the high-quality 600D Oxford cloth and aluminum materials. Have you ever purchased a product for camping before that, the moment you tried to haul it from a place, you realized how heavy it really was? It becomes a struggle and hassle to drag around a heavy piece of gear, which is why it’s so important to focus on purchasing only lightweight camping gear. So, with that being said, our favorite part of this camping item is that it won’t be challenging for campers to pack or unpack. Additionally, it comes with a nice, high-quality bag to help carry the table from place to place. When it comes to comparing the cost of this product to others on the list, consumers might take interest in this product because of its cost-friendly price tag. Additionally, when you begin to consider the amount of value that is included in this portable table, it makes purchasing this that much easier. So, if you are looking for a quaint camping product that can hold your meal, this may just be for you! This manufacturer focused on creating a high-quality table, which can be seen by it’s design, which includes durable holders and joints. The materials used to make this product boast quality, durability, and rust-free properties. Consumers will find peace knowing that it will not take hours to set up this table, nor require additional people. This camping item is incredibly lightweight and comes with a carrying bag for easy traveling. Consumers have complained that, if the ground is wet or moist the table and chairs will actually sink into the ground. Campers have mentioned that, after extensive use, the legs of the table may be subjected to breaking if not cared for properly, or stored in the right way. As we reach the middle of our buying guide today, we are very excited to bring to you the GCI Outdoor Compact Folding Camping Table. For those of you who do not know, GCI Outdoor is one of the most impressive brands in the industry, offering consumers a wealth of outdoor gear for camping, hiking, fishing, and many other activities. This specific camping item boasts a wealth of features, including lightweight materials, telescoping design, and even a lifetime warranty. Does it get any better than this? Have you ever had to set-up a product at a campsite that took hours? Let’s be honest, the last thing you want to do is assemble or product or read instructions. In the wilderness – you want to enjoy Mother Nature. With that being said, this product is perfect for individuals that are seeking to get straight to the fun at the campsite. All you need to do is assemble the telescoping legs and all the table to do its magic. The best part is, after all the fun is over, all you need to do is collapse the table. When it comes to differentiating from other manufacturers and competitors, this brand decided to make two different versions of their product, a smaller 20-inch version of the table and then a larger, 25-inch version. In our opinion, this is a great feature for consumers and campers as it gives an individual the opportunity to select what size suits their needs to the most. Both come with a telescoping design, making it easy to assemble or collapse. If you are looking for an item that offers both a great price tag and value to match it – this is for you. After spending the time that we have studying all the different camping products, this one is offered at one of the cheapest price tags yet offers some of the greatest value. From lightweight materials, two different sizes to choose from, easy to assemble, and even a 60-pound weight-limit, it’s perfect for some small-time camping. Consumers will enjoy how easy it is to set-up one of these products. Campers will have the option to purchase either a smaller or larger camping table, depending on their needs. This product only weighs a total of 4 pounds, making it a great addition to any camping gear set. This table can be used not only for camping, but also picnics, road trips, or even fishing excursions. Some campers have complained that this product is cheaply made and feels as if it may break if not taken care of. Users should not expect this table to offer the strength or durability as other, more expensive tables. As the next product on our list, we believe this may be one of the best tables for individuals that want an easy to pack and unpack design that is ultralight and portable. The Moon Lence Ultralight Folding Camping Picnic Table is one of the best in the industry boasting close to five stars and being reviewed hundreds of times by many individuals. Let’s talk about this quality camping table and what individuals can expect today from this brand. 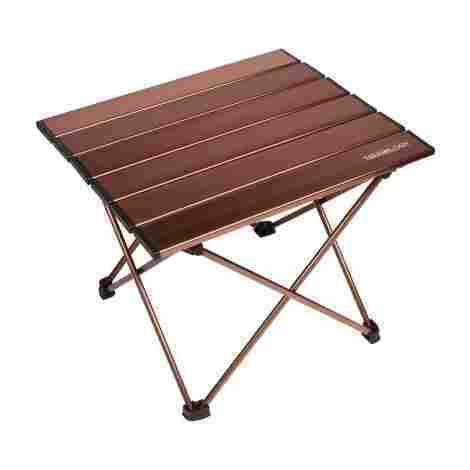 This particular camping table has a cloth top, which allows it to be more portable and lightweight than other camping tables. However, it is the durability that makes it one of the most impressive. The cloth material is made from a 600D ripstop Oxford cloth fabric that is extremely sturdy and has a long-lasting shelf life. With that, individuals can expect it not to rush or ware and tare easily. The frames are actually made from a high-strength aluminum material to ensure maximum durability. When it comes to camping, individuals want quality and comfort. Therefore, it is detrimental for products to be designed with a portable and easy to set up design and method. What that said, we can say that this is one of the best tables for individuals that want a portable and lightweight design. The foldable design is thanks to mesh inserts, extensible metal poles, and a cloth fabric that is easy to set up. 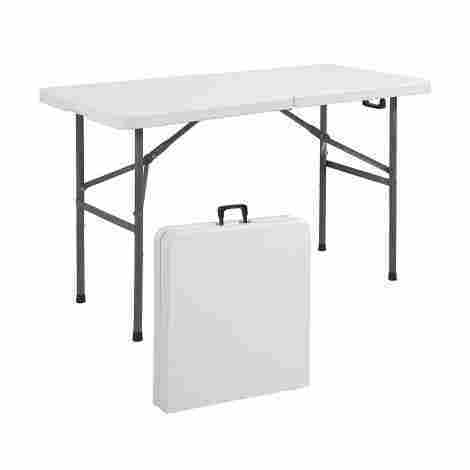 As we take cost and value into consideration for this item, we can say that it's expertly designed for individuals that want a quality and small portable table that is easy to set up and easy to pack. With that in mind, for the price, we believe it is one of the best tables out there in the industry. The table itself has an easy to pack and easy to store design making it ideal for individuals that do not want to spend a lot of money on a quality table. We highly recommend it as a two-person or four-person table. Very strong and stable design due to well structured holders that have sturdy joints. High durable design with a 600D ripstop cloth that is of the best quality. Great quality metal frame material design that is rust-resistant. Long lasting life time and only weights about 1.7 pounds in total. Easy to set up design that individuals will enjoy. Great for outdoor events, picnics, and more. High quality design that is well-priced. This product has been said to be small. 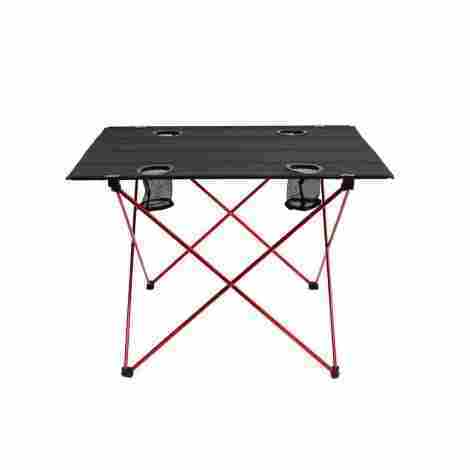 As one of the best camping tables out there, this is a fan favorite camping table for individuals that want a high-quality camping table that is extremely durable. With a hard-top design and a waterproof design, individuals will love the solid construction material that is very useful. We are eager to share the Trekology Portable Camping Side Table. Here are two important points to take into consideration. When it comes to the design of this portable table, individuals will love how well designed and structured it is. In fact, the table is made with a low height design, so individuals can use it with a chair or without a chair. The table is also very durable and made from some of the best and most top-notch materials in the industry. With that said, the aerospace-grade aluminum alloy body design is very durable and individuals can use it for long periods at a time. When it comes to the packaging design of this brand, they have excelled by giving individuals everything that they need to start using the table from the start. With that said, this brand includes the aluminum table top design and the mainframe, which are all portable. However, they have even included a carrying bag that is of the best quality design and material to ensure that it can withstand the test of time and the many adventures an individual may take. As we take cost and value into consideration, we can say that this brand is one of the best hardtop tables for the price. For individuals that want a quality camping table that can withstand the test of time and is very durable, we highly recommend this table. With that said, we believe that individuals will love the quality of this table and the design alongside the durability. It is important to keep in mind that this table may be unavailable at times, so if you are interested, get it while you can. High quality and durable camping table that is of the best quality. Individuals will appreciate the aluminum table top design that is very durable. Main frame is extremely durable and of the best quality. The carrying bag is well designed for an easy carry. Compact so an individual can take the table anywhere. Aerospace grade aluminum is of the best quality. Trusted brand designed and manufactured by phD engineers. Individuals have mentioned the table is too low to the ground. Now that we are getting toward the end of this list, we are eager to share one of the best dining table designs that are perfectly designed and manufactured for the everyday adventure seeker. This next table comes in three different designs and has an easy assembly instruction. We see it as one of the best and are eager to share it with you. With that said, we highly recommend the ALPS Mountaineering Dining Table. Here are two points to consider! When it comes to a proper picnic table design, brands have mastered a different way to create the ideal picnic table. With that said, we can say that this picnic table is one of the best for individuals that want quality and style all in one simple picnic table. In fact, this picnic table includes a foldable top design, but it is also made from an anodized aluminum to prevent any rust and also increase durability and protect from harmful UV light. With that said, it is extremely durable and can withstand the test of time as well as the elements. If you are tired of hitting your knees on the side, we can say that this is one of the best tables when it comes to leg design and sturdiness. In fact, the table is designed with an x-design that supports the side to never interfere with how an individual sits without limiting the structural integrity of the table. With that, individuals can expect that the design of the table is one of the best for long-term wear and tear. When we take cost and value into consideration for this particular table, we can say that it is properly designed for individuals that do not mind the weight but want one of the best tables for a long-term outdoor camping experience. Other than that, the price equally reflects the quality of the table and we believe that the table is completely worth it for the price. One of the best quality tables for the outdoor lover. The aluminum X-frame design is specifically designed to offer lightweight and stability. Quality table that does not interfere with how a person sits. Quality side support design that is really beneficial and easy to set up. Three different sizes and styles to choose from. Limited Lifetime warranty comes standards. Consumers have mentioned that it is not all that stable. 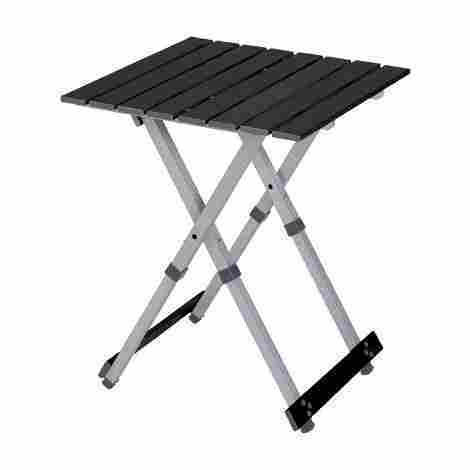 This next folding table may be one of the best folding tables for individuals that want quality with a simple style. In fact, it offers a really cool feature we are going to talk about below alongside many other features and specs. With that said, let’s talk about the Outry Lightweight Folding Table and what consumers can expect from this quality folding table. With an easy setup design, we see this table as one of the best in the industry. When it comes to camping, we understand that individuals are wanting portability, quality, and an easy to set up design. 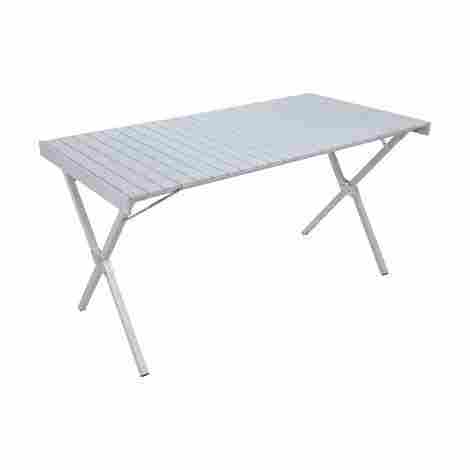 With that in mind, we can say that the quality of this particular camping table is in the easy to set up design. In fact, the table is a designed with aluminum alloy frame where all an individual has to do is take out of the carrying bag and open it. Other than that, just attach the fabric top and it is done. When it comes to quality and portability, brands have needed to get creative. Therefore, we were eager to learn that this brand uses a fabric top, much like many of the brands we have shared below. This fabric top is designed from a heavy duty ripstop fabric known as, 600D nylon. This is one of the best fabric and has in fact been used in tactical gear before because of the durability, lightweight, and breathability qualities of the brand. As we take cost and value into consideration, we can say that this is one of the best brands for the price due to the quality design and the material of the brand. Now, this manufacturer does offer this table in two different sizes, which of course, causes the price to the range. With that said, we still believe this is one of the best-designed tables in the industry for individuals that want quality and portability in one simple package. Sets up very easily and very quickly. Includes a carrying case for an easy and convenient carry. Ideal for outdoor activities and indoor use. Great quality table that is easy to use and easy to store. The top is extremely strong, and the aluminum is very sturdy. Individuals have mentioned the you have to be very careful with the clasp. As the last table on this list, we are excited to end on a strong note for our camper friends that want a quality camping table. This next camping table has one of the best easy to assemble designs alongside a lightweight and sturdy top that can withstand the test of time. With a one-year warranty, individuals can expect the table to be of the best quality design. Let’s talk about the Timber Ridge Folding Camping Table. Here are two points to consider about this table. As we have discussed, we only want to share the best quality tables in the industry. With that in mind, we can say that this is one of the best tables with an easy to set up design and extremely durable top. Now, the best part is that an individual can easily set up the table in minutes and put it together with an easy to fold accordion top. One of the best and most cool aspects of this particular folding table is the lightweight design and material. The aluminum top is very lightweight with a total of 9.4 lbs. The construction overall is perfect for sturdiness and durability. Individuals can expect that the table will be easy to adjust, set up, and take anywhere an individual wants. With a high-quality carrying case, individuals can expect the table to be able to withstand the test of time. As we take cost and value into consideration for this particular product, we can say that it is one of the best tables with an easy to set up design that is sturdy enough to withstand strong winds and heavy environments. With that, the table is designed to withstand the test of time and offer a great outdoor experience. For the price, individuals received a 27.5 x 27 inches table that is sturdy and made from a lightweight material. High quality picnic table made from a durable material. Durable legs that stay put and are easy to set up. One-year manufacturer’s warranty backs up any defects. Great reviews for the price. Individuals have mentioned that some of the aluminum bars are not designed that well. Now that we have talked about the top ten best camping tables, which one do you want? We were very pleased with the selection that we chose and found many of the camping tables on this list to provide everything that an individual needs. Whether you want a simple design that unfolds in two minutes and is very easy to set up or a more durable design that can withstand a lot of different wear and tear and hold a lot of times, you will find it in this list. So, which one did you chose? We believe that the design and the materials are the most important elements when it comes to a quality table, and we were proud to find brands going out of their way to provide such excellent quality. Now, one aspect that we share often in many of our articles is the Criteria and FAQ section. We do this so individuals can get to know our process and how we came to the conclusion of this top ten. Here are our excellent and thorough criteria to pick the best camping tables. Let’s begin! Now that we have shared the top ten quality camping tables of this list, we are eager to share with our audience the criteria in which we decide the top ten best camping tables. This criterion should be seen as a method of figuring out and learning what are the best camping tables in the industry. With that said, if you are a busy individual that does not have the time to properly do the research, well, we do it for you! So, if you are interested as to how we go about the choosing process, keep reading! What we will say is that it is not a simple task to venture into a genre that has so much variety, but we were amazed by the many quality brands and manufacturers that supply such excellent quality products. With that said, we are eager to share our in-depth criteria for how we pick and evaluate the best camping tables. Each one, in particular, went through all of the factors to below to ensure that they were properly designed and built to last in the outdoor elements. Now, let’s begin with the first criteria we always take into consideration, the quality of the table. As the first criteria on this list, the overall quality of an outdoor table is crucial for us to include it on the list. We do this by obviously, looking at many different factors, which are listed below. However, we also take into consideration reviews from many individuals and the overall aesthetic appeal of a table. You can tell a lot about a product just by the reviews and the design. With that said, we can say that all of the tables on this list were masterfully designed with quality in mind for individuals. Now, what makes up quality in our eyes? Well, one important aspect that we thought about was that the table had to be durable enough to be able to withstand the outdoor elements. No individual wants a camping table that cannot withstand a bit of rain, moisture, dust, and dirt. Therefore, this was the most important factor. Other than that, it had to be sturdy enough that it can hold different materials, drinks, items, etc. We will talk about sturdiness shortly. Another important aspect we took into consideration of quality is the appearance. No individual wants a camping table that looks like it was built from cheap plastic and thin wooden legs. Therefore, we made the table material another criterion to think about when picking out your ideal camping table. As one of the most important criteria to consider, why is material so important? Well, if an individual is out in nature with their camping table the material has to be able to withstand the test of time, nature, and the outdoor elements. With that said, we wanted to secure that the table material, if cloth, would not rip. We wanted to make sure that all of the metals or tops of the tables were designed with a tough material that can withstand heavy weight and the test of time. With that in mind, this is what we learned. Many brands use different top materials when it comes to producing the ideal outdoor camping table. Therefore, we discovered that the most common materials are an aluminum top and a cloth top. As far as the aluminum top this is mostly the ideal choice for individuals that want a large table top that is extremely durable and can evenly hold items. Other than that, an aluminum top allows individuals to have full courses, full meals and set it up for proper cooking. Other than that, most top aluminum materials are coated with a water-resistant material to ensure that the aluminum does not rust and wither. As far as cloth top design, we were shocked that most brands that use a cloth top use an extremely durable tactical cloth that is known in the tactical industry for its weather resistant and strong. As the second most common table top material for camping tables, 600D nylon is the most common cloth material that we came across. The purpose of this is that it allows for a more portable experience. Now, that we have talked about the two most common materials, let’s talk about the table design and what individuals can expect. As far as table design we learned early on that there is a wide variety of different designs that individuals can look out for. Most brands will offer a standard size table design alongside other designs. For example, brands that have an aluminum table top tend to offer up to three different sizes with designs that vary in height. Other than that, cloth brands tend to offer about two different designs that differ. As far as height, many brands have tables that are not known as standard eating tables, they act more like a nightstand table because they are lower to the ground. We have learned that these tables are ideal to have next to you if you are sitting in a low bottom chair or a zero-gravity chair. For example, since certain camping chairs are lower to the ground, individuals can easily get whatever they need from their side end table. With that in mind, all tables are designed to be lightweight and portable. For example, the aluminum top designs are more of an accordion style table that can easily be set up in minutes. While the cloth table designs tend to have fewer pieces to put together, simple the legs and the cloth top. Now, let’s talk about the leg design and sturdiness. This next criterion is one of the most important that we took into consideration for many reasons. The leg design is detrimental to the whole table. Without a proper structure design, the table can come crashing down with food and drinks and all. Therefore, we closely examined the leg design and what individuals were saying about the legs. We discovered that many of the legs differed as far as design and material structure. When it comes to aluminum legs, we learned quickly they were extremely lightweight but offered plenty of sturdiness. When it comes to cloth tops with plastic legs, we realized that the plastic is one of the most durable plastics in the industry. At times, some brands even offered color coated aluminum legs. 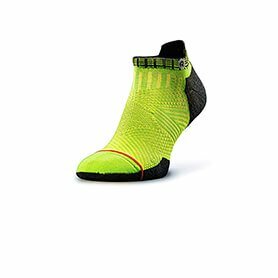 In any case, all of the brands on this list offered the leg design and sturdiness in a way that allowed for maximum durability and use. Also, the positioning of the legs was important, not just for the structural integrity of the table but also for the comfort of the individual. This was a key factor in ensuring that the table can withstand the test of time. Some tables offer a side position leg design, which means individuals could not place their feet or knees under it. While some tables, which tend to be longer in structure offer an end table x design for comfort and multi-use. With that said, let’s talk about the top design and sturdiness. We already covered some important aspects about the top of the table. Now, we want to cover the top of the table design and how they compare to each other. This was one of the most important criteria for us to take into consideration because we wanted to ensure that tops of the camping tables we were sharing were of the best quality design. With that said, we are happy to share with our audience how we came up with these top ten as far as the top. First of all, an aluminum top may be the best quality top to consider. The reason being is that an aluminum top allows for an individual to place items on top with the worry of the table falling over or the items being uneven, which can happen with a cloth top. However, as far as cloth top goes, we can securely say that the ones on this list are of the best quality. They are well designed due to the leg design which stretches out the top and with corner compartments, locks into place, creating a flat environment for individuals to place their items. With that said, another important aspect of the top of the table that we wanted to take into consideration is how well and resistant the top is. If the aluminum was coated with a water-resistant coating, we wanted to ensure that it would not rust. As far as cloth, we wanted to make sure it was durable, would not wear and tear, would not break easily, and would not stain in the case of any accidents. As we said above, we learned that the cloth brands have used is made from one of the best and highest quality grade tactical clothes in the industry. Now, that we have covered designs, materials, and sturdiness, let’s talk about the styles and available options. As one of the most important criteria to take into consideration, styles and available options were crucial to ensure we shared a wide variety. With that, we discovered that most brands tend to offer different sizes. However, the style stays the same. Therefore, we focused on providing different quality camping tables. For instance, some of the brands we shared offered rectangular tables in different sizes. While some brands only offered square tables at different sizes. With that in mind, there is not much you can do when it comes to colors of aluminum. However, some of the cloth table brands offer their camping tables with different color choices to choose from. In any case, individuals should find a wide variety of different camping tables to choose from in this list. Now, how much does an average table cost? As always one of the most important criteria that we take into consideration is the cost and the value. Our intention we every product that we share is to provide the maximum quality for minimal cost. 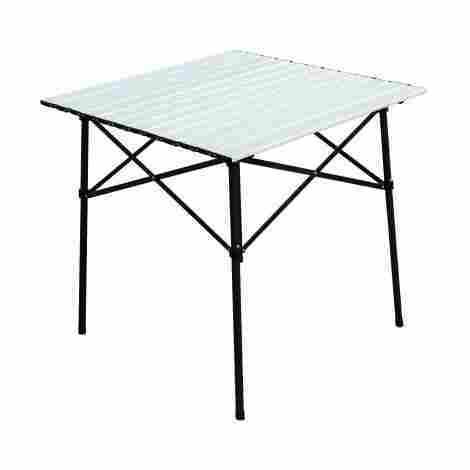 With that in mind, individuals can expect that the more sturdy aluminum body and frame camping tables will cost more. 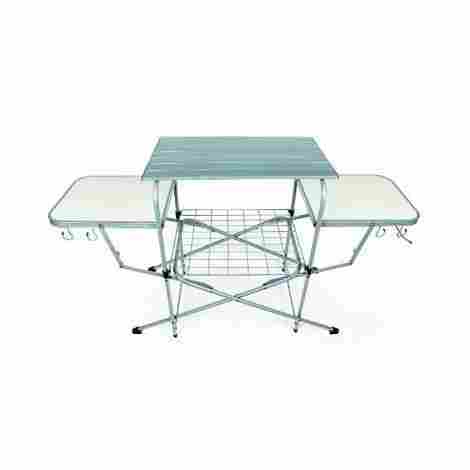 Another aspect that raises the price of a camping table is the design and the size of the table. Now, we do believe that all of the tables on this list are priced really well and individuals will receive a lot of different value for the cost. Whether you want a simple day table that you can use next to your zero gravity chair, or you want an all-out dinner table that you can set up for a romantic dinner date, this list offers ten valuable chairs priced to sell quick! Lastly, we want to share the last criteria on this list that we took into consideration. As the last criteria, we wanted to include the ability of different features. We added this in there, because depending on the features of the table the value and price may go up or down. Therefore, we added this in to ensure that all of the tables were designed with the best features in mind. In this process, we discovered that certain brands included in their table design cup holders and other different elements. For example, certain brands have integrated cup holders into their drink pouches for maximum comfort style. What we can agree on, is that all of the brands that offer extra features did it for the ease of use of the consumer and they are all highly worth it. As we wrap up our criteria, let’s talk about the frequently asked questions and what individuals can expect when it comes to the most important answers. Q: Is the aluminum water-resistant? A: As the first question on this list that individuals are wanting to know about, we can see why water-resistance would be at the forefront of an individuals mind when it comes to aluminum. Aluminum, unless it is treated is known to rust easily in the case of water. Since camping tables are designed for all-day wear and tear while out in nature, individuals want to know if they can also withstand a bit of rain and moisture. With that said, most camping tables are treated with a water and liquid repellent material that ensures it will not rust. However, to be sure it is important to read the product description to ensure that the table is water resistant. Q: Are the materials water and stain resistant? A: As a similar concept to the last one, when individuals are opting in for a cloth table top, they are seeking to know if the cloth is water resistant. With that said, most 600D nylons are extremely durable. However, when it comes to water resistant it is important to read the description to ensure the product is in fact, water resistant. Q: Does the table come with extra pieces? A: As another important and vital question, individuals are eager to know if the tables come with any extra pieces. With extra pieces, individuals can rest assured that the table will be able to easily be put together in the case that they miss a piece or piece brakes. With that in mind, some brands do have at least one extra plastic connector or another important piece in the case that something gets lost. However, most brands do not have tiny pieces that need assembly, they are already designed for easy assembly. Q: Does it come with a carrying case? A: As another vital and important question to consider, many individuals ask if the table comes with a carrying case. In this case, it would not be a sensible decision to offer a camping table without a carrying case, so the answer is yes. All brands come with a carrying case that makes it easy to pack, carry, and store the table. With that said, most cases are made from a strong fabric that is stain and water resistant. Last Min Gear: What Gear Do You Really Need to Camp?